Hello LosAngeles - Team Challenge Game in Downtown L.A. Team Challenge Game in Downtown L.A.
Los Angeles is being ravaged by a massive outbreak of the "playgue" and only you and your friends can stop it. In this 90-minute mad dash through the heart of Downtown L.A., your team of 2 to 4 players will compete to save as many lives as possible, by solving a series of self-guided trivia questions, locating sites, tackling mental challenges, and navigating the most strategic route possible. 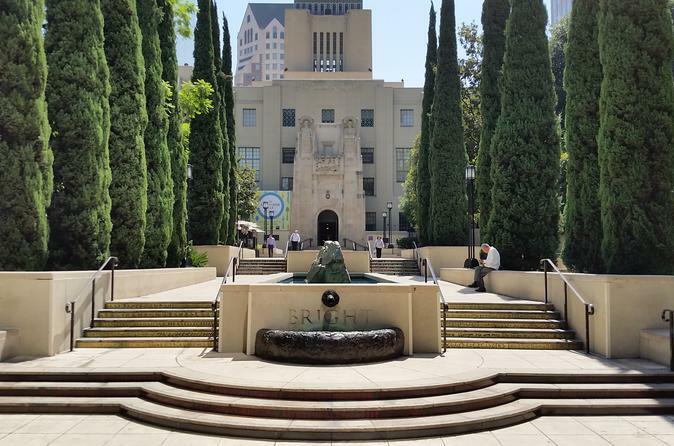 This off-beat game played by teams of 2–4 people begins at Central Library in Downtown L.A.. Armed with only your wits and your cell phones, try to help a team of completely inept scientists discover the cure to a mysterious disease known as “the playgue." As you travel to different outbreaks within a 4-block radius, be prepared to solve scavenger hunt questions, pub-style trivia, and brain puzzles at each location to earn points. Points earned are lives saved. Your entire team must work together using their collective knowledge and mobile phone search skills. The game permits up to two pauses in case the kids need a bathroom break or your sister-in-law starts complaining about blisters. This self-guided event can be played on any smartphone or tablet device. Your team can start whenever you're ready, as long as it's during daylight hours.